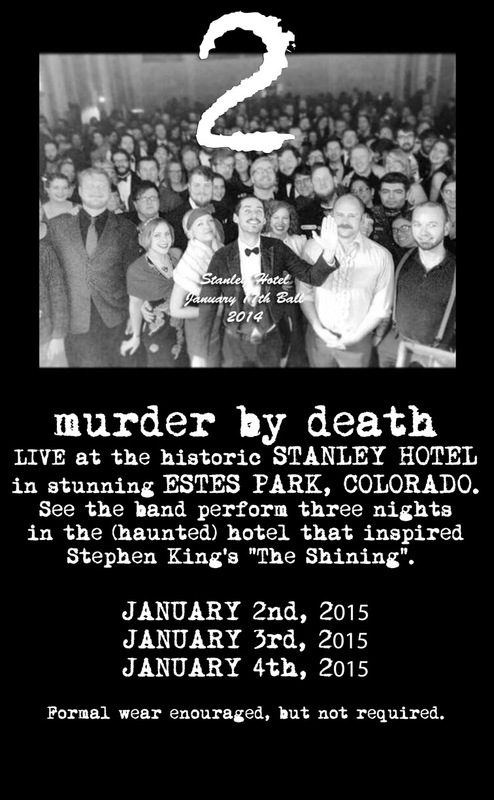 We are so excited to announce that we will be playing three more shows at the Stanley Hotel January 2, 3, & 4, 2015. After speaking with many of you at last year's event, we decided this is something that we've got to do again. It was the most exciting, fulfilling and simply fun event we've ever been privy to in the 15 years we've been in this band. We know that many of you traveled last year, so you wanted to give you more time to make your plans to come to the party. Last year the shows sold out in 24 hours, so you'll definitely want to get your tickets early. Get 'em here http://store.murderbydeath.com/. The ticketing is done directly through our website, and there will be no added ticket fees. You'll receive a commemorative poster at the show. Last year so many of you dressed up, and we loved that- so we encourage you to do it again if that's what you feel like. With your support we want to make this an annual event. I'm sure these will be memorable nights and I hope you can attend. If you aren't able to attend the Stanley shows, please note our upcoming tour dates on http://www.murderbydeath.com. We look forward to seeing your lovely faces. Thanks again for making unique dreams like this come true. Tickets will be $50 each night including all service fees. TICKETS WILL BE WILL-CALL ONLY. NOTHING WILL BE SENT TO YOU. You must be at least 21 years old to attend the show. Like last year, these shows will sell out in advance. Tickets will only be available through our website. Please do not call the hotel for tickets. Included with ticket price is a screen printed poster. No additional ticketing fees! Pick up your commemorative poster at the show. Formal wear encouraged but not necessary. You've seen the movie. Please call the hotel directly to book rooms (970-577-4000 / 1-800-976-1377) to book your room in advance. Use code whowillsurvive to get 20% off the room rates. The code is only good when calling the hotel, not online. This is for booking rooms only. They will not be selling tickets. THREE BIG ANNOUNCEMENTS! 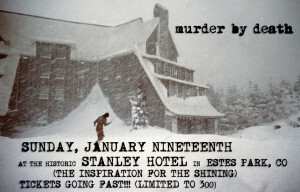 Come celebrate the 10th anniversary of "Who Will Survive and What Will Be Left of Them" with Murder By Death at the (haunted) Stanley Hotel Concert Hall in Estes Park, CO- Stephen King's inspiration for The Shining. See an intimate performance of the entire album plus many more songs. Only 300 tickets avail per night! Included with ticket price is a signed and numbered screened poster and ticket. No additional ticketing fees! Your tickets will arrive by mail within two weeks before the concert. Make sure you include the correct address. Pick up your commemorative poster at the show. Please know tickets are only available from our website at the links below. Please call the hotel directly to book hotel rooms, but they will NOT be selling tickets to the event. Tickets can only be purchased from our website. Mention WHOWILLSURVIVE when you book your hotel room at The Stanley Hotel and get 20% off! Call 970-577-4040 to reserve a room. If you can't make the show, get the special edition 10th Anniversary reissue of WWS. 200 gram color vinyl, Mirrorboard jacket, reimagined art with old photos, a retrospective letter from Adam, five additional songs on a second record, etched bside, digital DL and more! Buy a ticket to the show and get a 33% discount code for the vinyl! THIS ALBUM HAS NOT BEEN AVAILABLE FOR PURCHASE DIGITALLY FOR SEVERAL YEARS. WE RECENTLY ACQUIRED THE RIGHTS TO IT AND THOUGHT A TEN YEAR ANNIVERSARY RELEASE WOULD BE PERFECT. PREORDER THE SPECIAL EDITION VINYL AThttp://www.murderbydeath.bigcartel.com OR GET THE ALBUM NOW AT AMAZON MP3ITUNES COMING SOON! St Petersburg, FL and Savannah, GA shows added. New Posters! TWO NEW SHOWS ADDED! We are headlining DONT STOP FEST in ST PETERSBURG, FL October 5th. also, we are headlining the Jinx's 10th Anniversary Party in Savannah, GA October 10th @ the Jinx (of course). American Aquarium and a Burlesque show are opening! Awesome! Tour starts in a few days, we are excited to see all yer faces. FINALLY! You can now download the kickstarter covers we recorded! If you don't know about it, we did a crazy kickstarter in July of 2012. One of the high-pledge options was for folks to choose a song for us to cover. A huge variety of songs got picked by people from all over, and we went into the studio in December to record them. We had 15 songs we needed to cover and learned, reworked, recorded and mixed them in a sleepy whiskey-fueled 13 days. Some were silly songs, some classics. It was a riot to learn and record them. As of now there are no plans to release them on any format other than digital and our bandcamp site is the only place you can get 'em. Now that we have secured the rights, you can download these tracks at http://www.murderbydeath.bandcamp.com . If you donated to the kickstarter a free download code is below (with an option to donate if you are feeling nice!). If you were one of the folks who pledged we are working on the artwork for your one of a kind CD of the track! We will send em out end of this month. Hope you all enjoy! ALSO CHECK OUT ALL OUR TOUR DATES!